One of the most outstanding features, in this women’s hiking boots, is the ventilated mesh lining. The mesh is meant to let in air into the shoe, such that your feet stay without sweating, when you are hiking the mountains or meandering the valleys, during the sunny days. With this KEEN specialty for women, your summer adventures just got better. 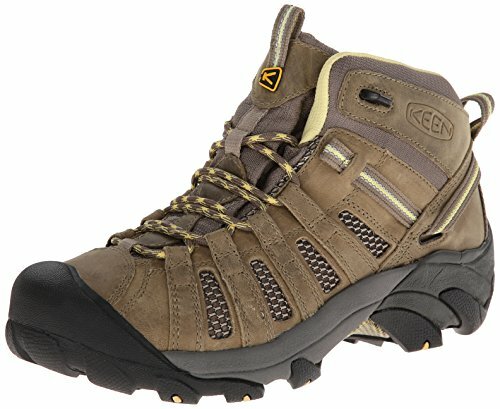 KEEN Women’s Voyageur Mid Hiking Boot, composes of a leather waterproof upper coating as well as a mesh lining. The leather brings to the shoe, the benefits of the most popular natural material, for making shoes. It ensures that the inside of the shoe does not get wet, from rainwater or dew. Hence, these boots are appropriate to wear during winter or the wet season. The good thing about this shoe is that the mesh lining, prevents the shoe from overheating, and when it rains, the mesh dispels the moisture. Stability is an important factor to consider when you are choosing a pair of hiking boots. However, it should go hand in hand, with comfort and convenient, something that KEEN has included in this women’s hiking boots. The ESS shank is applied on the boots, to reinforce it and provide the needed stability. Forget the traditional lacing, which can take you quite a long time, to pull through. For those of us, who dread laced shoes, to the point of giving up a good boot, just to avoid lacing, you will love the convenience that comes with this pair of boots. The hiking boots feature ghillie-lacing mechanism, which is faster and easier. Both sides of the lace vamp have loops, which you use to fasten the shoe. The result is a secure fit, which you certainly need to cruise and climb along hiking trails. These hiking boots have a powerful outsole, which is dedicated to grounds, which are rather irregular. The sole has lugs of about 4mm, which provides great traction. This ensures that your feet are on the ground. Last but not the least, this pair of boots from KEEN, has a gusseted tongue, to offer adequate protection to the tender feminine feet. It keeps your toes in good condition, notwithstanding the terrain. KEEN Women’s Voyageur Mid Hiking Boot is your summer companion. It is designed to provide your feet with ventilation when the rest of the world heats up. Get into the boots and face your dream hiking adventures with confidence. The mesh lining and the cushioned interiors will maintain your feet at their best, to drive your zeal for maneuvering mountains and valleys.